The god has created laddu with their power in the faith of goddess Parvati. When both Shiva children asked laddu then goddess Parvati asked to prove their superiority. Lord Ganesha proved his superiority and gets that laddu. Since then, laddu or modak offer to lord Ganesha. The round figure and round seeds of laddu are the symbol of Mercury. 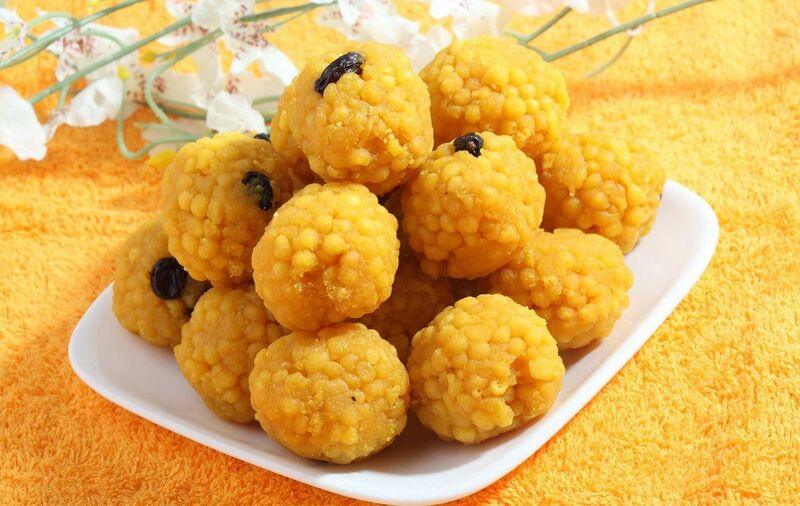 The sweetness of laddu relates with Sun-Mars. The fragrance of laddu relates with Moon. The dry fruits in laddu are the symbol of Venus. The yellow color of laddu relates with Jupiter. The unequal seeds control the Rahu-Ketu. Therefore, one laddu controls nine planets. The bundi laddu is beneficial for astrology and planets. Offer the same number of laddu as age to lord Ganesha. Chant Ganesha “Om Gum Ganpataye Namah” with every laddu. Eat one laddu and donate others. This avoid employment problem. Do this remedy on Wednesday. Offer one big laddu to lord Ganesha. It is beneficial to take big laddu. Offer it and worship for immediate childbirth. Take four part of laddu. Feed one part to any beast and one part to poor people. Husband-wife should eat the remaining part. This will avoid childbirth problem. Do this remedy on the day of husband birthday. Offer 108 laddu to lord Ganesha. Chant “Om Ganesha” with every modak. Donate every laddu as sacrament. Do this remedy when you face too much problem due to wealth or debt. You can do this remedy in morning on any day. Good Luck: In horoscope, if Moon is weak then you should include milk and milk products in your diet. Do not eat fast food.